Do you see the watermelon growing off of the fence? There is actually another one, lower down on the other side. If they keep it up they will be growing out in the middle of the yard! 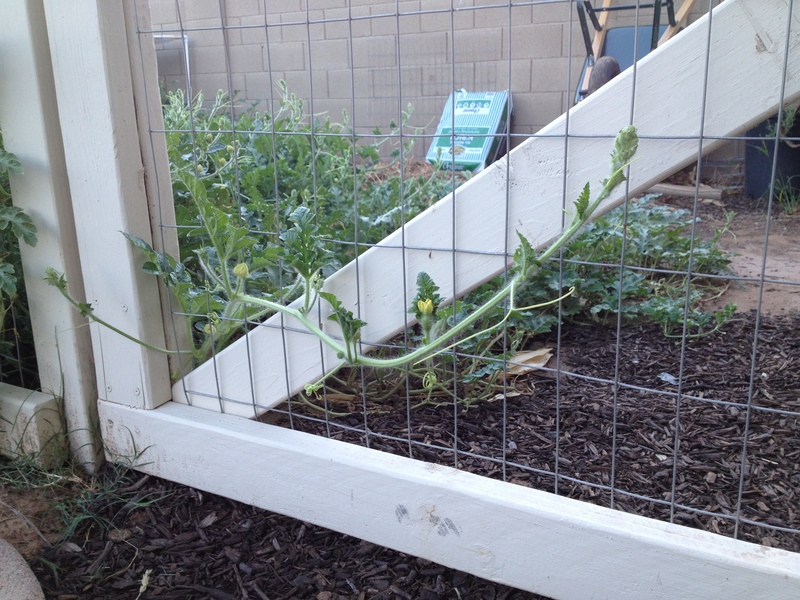 This entry was posted in Arizona Garden, Desert King Watermelon. Bookmark the permalink. 13 Responses to Rise of the MELONS!!! Wow! Not to be too dramatic, but I have nightmares like that! Sorry to hear it. In the gardening calendar that I follow there is a note next to tomatillos that says “Easy”. Getting them to grow… yes, getting them to be productive… that’s a different story. The worm that bores up through the stem of any kind of vine plant is called “Vine borers”. They start life as an egg laid by a fly on the stem of the plant near the soil line. Upon hatching they will bore into the stem and start there munch up the stem until one day the plant just keels over dead. It usually dies right after the first couple fruits of the plant mature. I have yet to find a way to defeat the little buggers. Lynda, Hmmm, never heard of termites eating plants before. I sure hope they don’t decide to migrate to Nebraska. Wow, I’ve never heard of termites doing that before either… but definitely not a good thing since termites are a real issue out here. Wow, those are some watermelons. 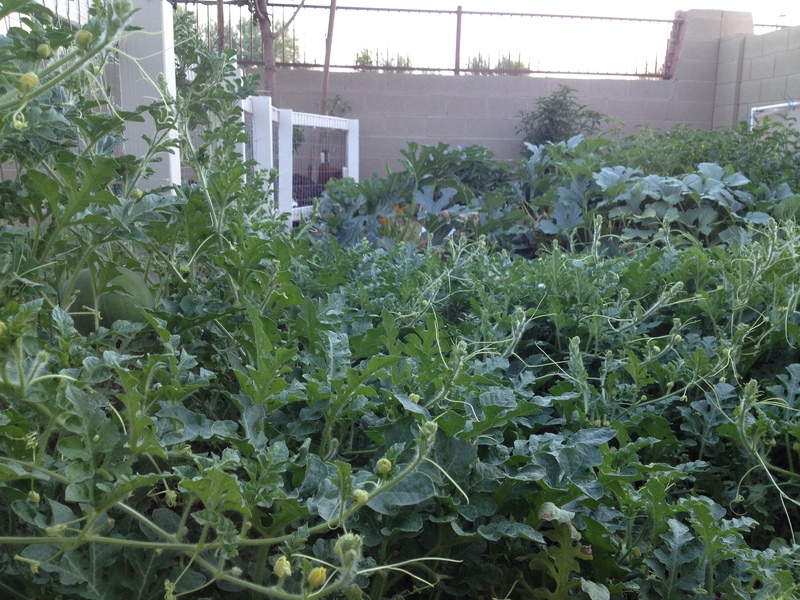 Watermelons were a bust here this year. They just never really grew. They are totally wimpy and have no fruit what so ever. Last year we got about four off four vines. Not that great either. I should be taking lessons from you I guess. Have a great watermelon day. 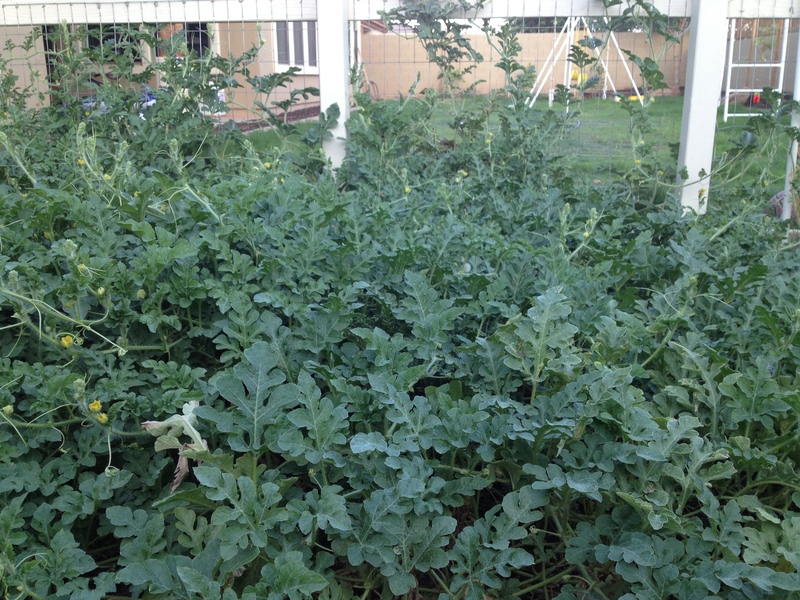 Yah the monsoon rains have really been good to the watermelons. The part I love is discovering down the road that I have a watermelon growing in that big mass of green. Dear Mr Jones. I wish to give the comments above the seriousness they deserve – but goodness me I have to laugh when I think about how stoic we gardeners really are. We get termites (never heard of that before), we get grubs, we get pestilence of every kind …… I could go on. We may go into a corner and sulk and promise ‘never grow that again!’. But do we give up? No. We bounce back to face another day – armed with a shovel, a fork and a look of steely determination. So, rising above the challenges, it’s lovely to hear about your melons giving you a second feed. Wow! I cannot believe that field of melons! I’m so envious! Thanks! They have been really good this year.